We have received almost a foot of snow on Wed. We will resume snow making Wed. and Thurs. night and are tentatively planning to open for skiing and riding on Sat. Nov. 26th. This is all weather dependent and relies on our ability to make snow on top of the white stuff mother nature gave us today, so please check back on Fri. for the latest. The Mountain Coaster and Giant Swing will operate Fri. Nov. 25 – Sun. Nov. 27 from 9am – 4pm. The Indoor Adventure Zone, with two bouncy houses, Spider Mountain Climb and Bungy Trampoline, opens the same dates from 10am – 4pm. Looks like winter is finally here! Our Snowmakers were hard at work again early this morning to get a nice coat of white on the slopes from top to bottom. The Weather Man is also saying that tonights storm might bring up to 14 inches of snow. Now that's what we like to hear! Listed below are all of the signs that will be auctioned off. The event is being held this Saturday, November 26th 2011, in the upper level of the Artist Falls Lodge, and will run from 3pm-4pm. Hope to see you there! 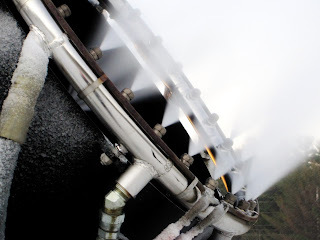 After midnight, our Snowmaking team put winter into full force on the mountain! 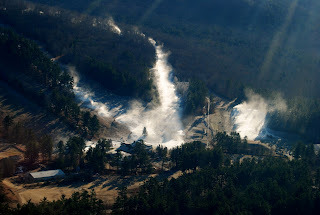 the second day of snowmaking this season, which means the season is really getting close! Keep up the good work guys! Here are a few photos of what Cranmore looked like this morning. All photos were taken by Cranmore Mountains Social Media Coordinator, April Deschenes. With winter operations right around the corner, Cranmore has been working hard to get ready for the season. We’ve had a few projects under our sleeves, and are excited to share them with you. Our main base lodge, Skimobile Station, has had its walls freshly painted, cafeteria area modified, and 3rd floor made a little more spacious than it has been in years past by adding more floor space. Our rental and repair shop is also going through transformation, and its new design will make renting equipment and getting repairs a smooth experience for our guests. The new Indoor Adventure Center, located in the Artist Falls Lodge is coming along very well. The fun has started to move in and get set up in anticipation of exciting times to be had this winter by those who don’t fancy snow and cold weather (and even those that do!). 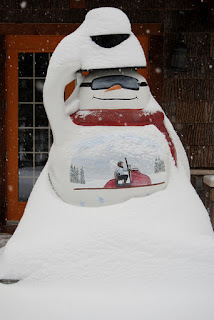 Also in the Artist Falls Lodge, what used to be the weight room of the Fitness Center, is now being made into a dining area to cater those who want to have a snack and warm up after fun runs down our Tubing Park, and other attractions located in our Mountain Adventure Park. We are all excited about these new changes, and hope that you enjoy them as much as we do! Our trusty snowmakers began their winter season last night with the first snowmaking efforts of the winter 11-12 season. With over 70 new snow guns added to our arsenal, we’ll be able to make more snow using less energy. Thanks to our new social media coordinator, April Deschenes, for these lovely photographs! We are shooting for a Nov. 25th opening. 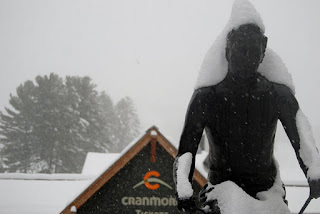 Check back at www.cranmore.com for the latest snow report!